When we first covered the Nabi Dreamtab, I have to say I was pretty disappointed. Thankfully, some things have changed and I must admit that I am pretty impressed with the changes that Fuhu has implemented. 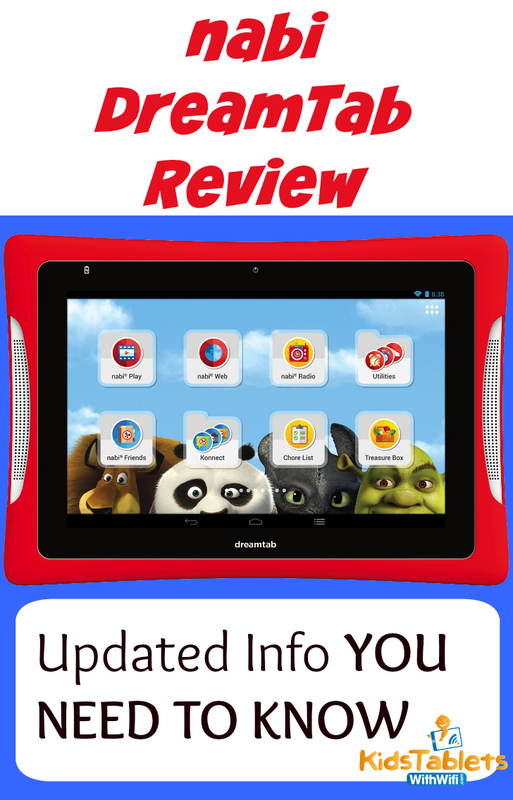 This updated Nabi Dreamtab review will show you a few of these great changes, and explain why this tablet is now one of our most recommended tablets for kids. When we first looked at the Nabi Dreamtab there were a few major concerns that needed to be disclosed. First, it had a really hefty pricetag of $269. That’s a really high price for what it actually delivered, especially if you were comparing it to other tablets above $250. The second concern that we had at the original time of review was the battery life of the tablet. It died and it died really fast. Typically this tablet would only last about 4 hours between charges and that was simply unacceptable. Thankfully, Fuhu (Nabi’s parent company) actually paid attention to their customer’s complaints and after taking a look at the updated Nabi Dreamtab, I have to say I’m pretty impressed. What’s Changed on the Dreamtab? Well, the very first thing that was noticed on the updated Dreamtab was its new lower price. It dropped in price a staggering $70 to $199. This puts it in a much more competitive arena for what the tablet delivers. The second thing that has changed on the Nabi Dreamtab is its processor. It was switched out from the original Nvidia Tegra processor to a more streamlined Intel Baytrail Atom processor. This has resulted in a smoother user experience without a loss of power. The big thing that changed since the Dreamtab processor switch is battery power! This tablet will now go anywhere from 6 hours to 8 hours without needing a recharge depending on what tasks you are doing with the tablet. Also, it charges much faster now as well. I found that it typically only takes about 2 and a half hours to get the tablet fully charged while it’s turned off. That’s a REALLY big upgrade from the original tablet which only lasted 4 hours and took almost as long to fully charge. So, back to basics here. The following pros and cons list will highlight some of this tablets biggest features, as well as some of its fatal flaws. Power – The Nabi Dreamtab has as much power as many home computers. This results in a great overall experience for children and adults as well. Nothing irks me as badly as sitting there waiting for something to install on my child’s tablet for 20 minutes while I hear “is it ready?” the entire time. Display – With a gorgeous 8-inch High Definition screen, this tablet will showcase games, movies, books, and apps with crystal clarity. Growth Capability – The Nabi Dreamtab is designed for children in the 6 – 11 year old age range. It’s built from the ground up to scale with kids as they get older. From educational apps to entertainment management parental controls, you can rest assured that your child will have a safe and fun experience all while learning a few new things. 2 Cameras – The Nabi Dreamtab has a front and rear facing camera with the rear camera being a 5.0 megapixel camera. Coupled with the Dreampro Studio, your child can create and edit their own movies with ease. Variety – With the ability to access the Google Play store as well as the Nabi Store, the supply of apps, games, books, and movies is virtually limitless. This will ensure that the games your child wants are available, and the list of educational apps is quite impressive. Innovative Apps and More – The Nabi Dreamtab has some pretty impressive design apps that are included straight out of the box. Kids can draw, animate, record video, and even write books all out of the box with no additional charge. On top of that, you have the Nabi Chore List app and parental controls that has made me a Nabi fan for the last few years. Private Social Network – A really innovative feature that the Nabi Dreamtab offers is a private social network for kids. You can easily manage this app as a parent and it has been TRUSTe certification for COPPA compliance. This means that you can feel secure knowing that your children are only talking to approved contacts. Time Management Controls – You are able to not only decide which apps and videos your child has access to, but also how long they may perform each task. Read for an hour, educational apps for an hour, or games for an hour. The choices are yours. Endless Entertainment – With children ages 6 – 11 in mind, this tablet has access to Netflix, Youtube, Dish Network, and any other streaming applications you wish from the Google Play store. Best of all, you can choose which ones you want your child viewing. Expandable Memory – By using SD cards you can expand the included 16GB memory. This is very important for being able to load movies onto your child’s tablet for those oh so wonderful long road trips. Price – While the price has been significantly decreased, it is still among one of the more expensive kids tablets. The good news is that this one is going to be an investment that will grow with your child for several years. Warranty – The Nabi Dreamtab only comes with a 1 year warranty which is a bit upsetting considering its price. The good news is that you can quickly add an extended warranty from many of the retailers that carry the Nabi Dreamtab. Cameras – While the Dreamtab has an impressive 5.0 megapixel rear facing camera, it can tend to not function well in poor lighting. This can become frustrating for kids in dark environments. Basically, if your child is wanting to shoot video, make sure the lights are on to avoid frustrations. Overall the updates that Fuhu made to the Nabi Dreamtab have made it a wonderful tablet for kids that encourages imagination and education. With the Dreampro Studio, your child’s creations can truly be limitless. By taking advantage of the Wings educational apps, you can ensure that your child continues learning while feeling rewarded as well as challenged. Overall, this tablet has went from disappointing to a very good tablet for kids with a pretty decent price point. What Are Your Thoughts On the Nabi Dreamtab? Have you had the opportunity to try out the Nabi Dreamtab? Do you have any questions or concerns? Please feel free to leave your thoughts, questions, and comments below. Thanks for reading and best of luck finding the perfect tablet for your kids! My Nabi seems to be the NON-upgraded version how can I tell for certain and if I have the NON-upgraded version is there anything that Nabi will do to help me fix my battery problem it seems to last only 3-4 hrs and it seems slow and seems to take about 5hrs to charge. I did want another one so my sons sister wouldn’t be jealous but with the problems I listed above added to the fact that I still haven’t figured out how to set it up so that my son can only play free learning games from Google and not all of the free non-learning games that Nabi has preloaded now I am not so certain that I want another Nabi, Maybe I should research to find something else that has more educational games and has more battery life with less charging and faster!!! What parent after all, wants their pre-schooler sitting around for hours playing Non-learning games? Please give me some advice asap, I need to figure out what to do and I need to solve the jealousy problem between my two children! P.S. I bought my son’s Nabi in December 2015. Hi Mitzi and thanks for the comment! If you purchased your tablet in December of 2014, I would strongly urge you to contact Nabi Cares Support at 1-855-275-6224 as your tablet is still under warranty. I have had very good experiences with their customer support department and I’m sure that they could help you get the issue resolved. Once again, thanks for reaching out and I hope this helps you get the issue resolved! Yes, the Nabi Dreamtab does have wifi connectivity built in so long as you already have wifi in your home. You can also access wifi hotspots on the Dreamtab. I bought 2 dreamtabs in December 2015. They are the old ones. No battery life, they can take up to 8 hours to recharge(shut off and plugged into a Nabi wall plug.) The charger port is on the bottom so I have been through 8 or 9 chargers already. My youngest has had his sent in twice and my oldest just got his back today after the Third time! They sent a different tablet but the bottom of it is cracked and it is bigger so the bumper we have does not fit. It has a scratch on the back and on the screen and the words printed on the back are somewhat worn off. Obviously a used tablet. I do not have the kind of time to be calling Nabi and packing it up to send it back just to see how disappointed my kid is because his “new” Nabi doesn’t work! Shoulda bought an Ipad. Wow, you have certainly had a pretty rough time with the DreamTabs. I really hate to hear that, but unfortunately you’re not alone. In the last few months, my daughter’s Nabi 2 had to be sent back twice. Nabi sent us the newer model now, and hopefully this won’t be an issue anymore. Best of luck to you finding a new one for your boys. If they are a little on the older side (8 and up) then I would certainly recommend giving the iPad Mini a go. Just remember to get a durable case for them. I personally like the Otterbox Defender Series and use them on not only my iPad, but my iPhone as well. Thanks for reaching out! There should be a silver sticker on the back of the Dreamtab that has a manufacture date on it. All of the ones made in 2016 are using the Baytrail processor. Hope this helps! Thanks Tony, I found the silver sticker the model number is DMTAB-NV08B and this other number DT08A. 30034837141011, however no dates so does in the model number NV indicate the processor is a NVidiategra? Thank you in advance! I found the silver sticker the model number is DMTAB-NV08B and this other number DT08A. 30034837141011, however; no dates so does in the model number NV indicate the processor is a NVidiategra? Thank you in advance!